Clear all jellies and reach 85000 points to complete the level. 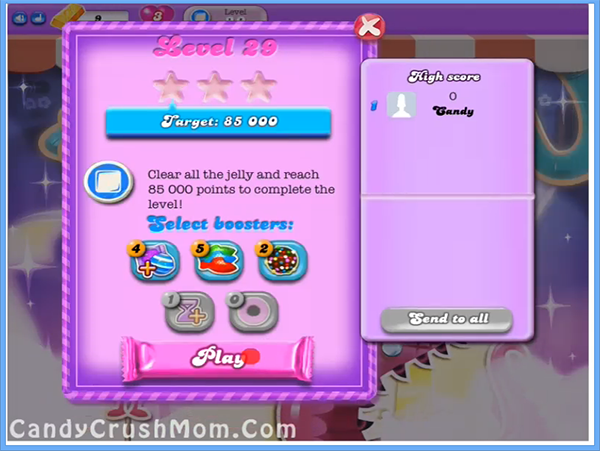 This level again have requirement to break jellies and out of big 56 candy board 42 are jellies and some of them with meringue blocks. You have only 25 moves and it means you must need lot of special candies like striped candy that you can get by combining four same color candies or colorbomb that you can get by combining five same color candies and you should also try to combine special candies with each other. To break more jellies you could also struck the moon by increasing power and also you shouldn’t forget to balance the Odus owl. We completed this level with 25960 score and luckily get two colorbombs that help to complete level within last move and get three star points on score board.